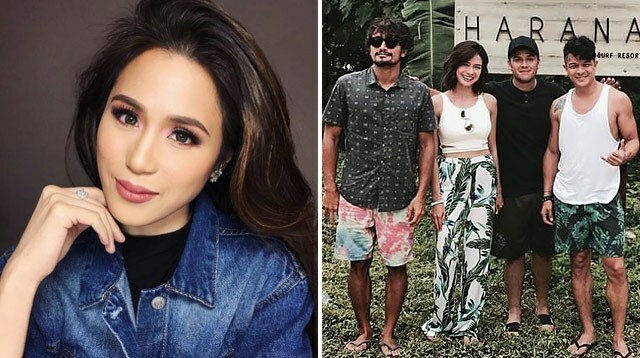 After months of cheating rumors around director Paul Soriano's alleged love affair with Erich Gonzales, the star of his latest movie Siargao, the legal wife finally speaks up. At the sidelines of the launch of Toni Gonzaga's latest business venture, Happy Cup milk tea, Toni expressed confidence in her husband's fidelity. She said she is unfazed by the rumors and prefers to trust God and her woman's intuition. "Ewan ko, ayaw nating magsalita nang tapos, but we always lift it up to God na sana 'wag kaming dumaan sa ganung klase ng pagsubok, trial, o ano pa man na challenge sa married life. Naniniwala kasi ako sa intuition, kasi sabi ng mommy ko kahit walang issue, kahit walang tsismis, kahit walang ano, may woman's intuition." Toni, however, was tongue-in-cheek about the whole thing and told the press to check in on her next month. "Kahit walang isyung lumabas, 'pag may naramdaman kang intuition, most likely 80% of the time, it's true. Pinakiramdaman ko, so far wala pa naman. Baka next month, tingan ninyo kung ano ang mapi-feel ko, pero so far wala pa naman." This is not the first time Direk Paul has been linked to his film's leading lady. In 2011, during the filming of Thelma starring Maja Salvador, the two were said to have a fling—a rumor vehemently denied by both sides. The director was also said to have dated Camille Prats in 2007, around the same time Toni and Paul professed their love for each other in an interview with Boy Abunda and Kris Aquino.